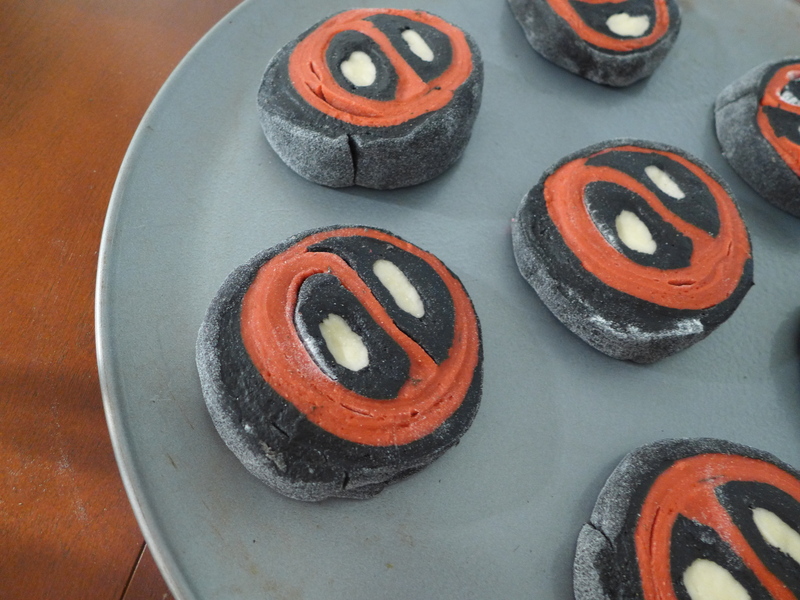 In honor of Deadpool slicing his way into our screens and hearts this valentines day, Kitchen Overlord is posting a week of edible homages to the Merc with a Mouth! 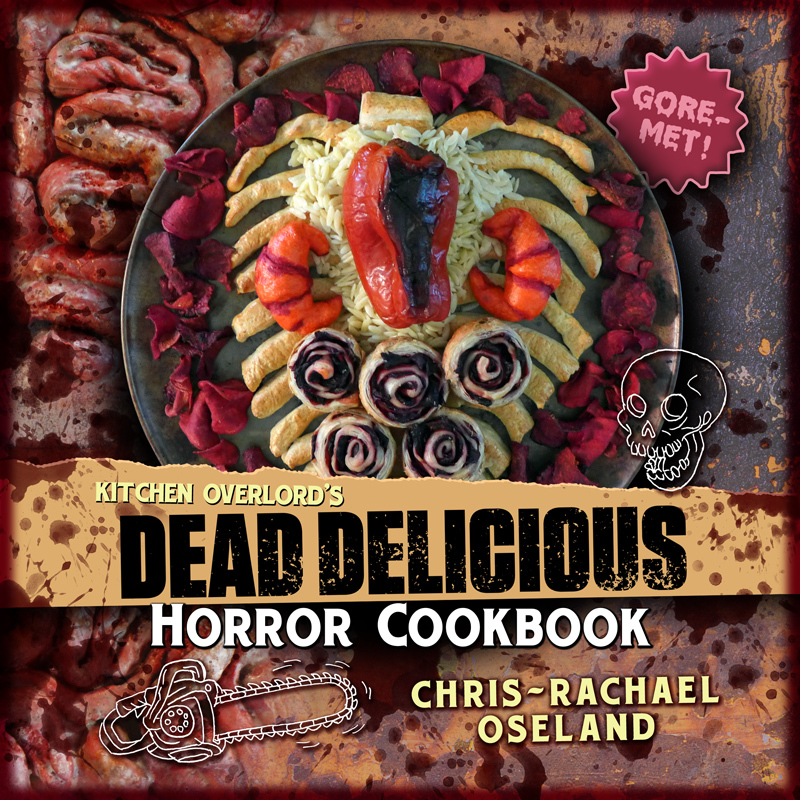 Come back every day for recipes ranging from bread to sushi to pie – and, of course, chimichangas! This tasty tribute to the Merc with a Mouth will be as big a pain in your side as Deadpool is to Wolverine’s but one look at those scowling little faces and somewhere deep inside you’ll know it’s worth it. Or maybe you’ll want a chimichanga. They’re a lot easier to make, and come with the added bonus of not creepily staring at you while you cook. You saw that list of ingredients and still want to make some bread? You know you could make a nice chimichanga instead. Fine. Get some minions. I’m not kidding here. If you try to do this alone, you may be inspired to cut off your own arm just to see if it’ll grow into a complete replica of you who can help out in the kitchen. If you’re not Canadian, you probably don’t have some kind of mutant healing powers. Minions are your only answer. If you have minions, all three of you should make your dough’s simultaneously. 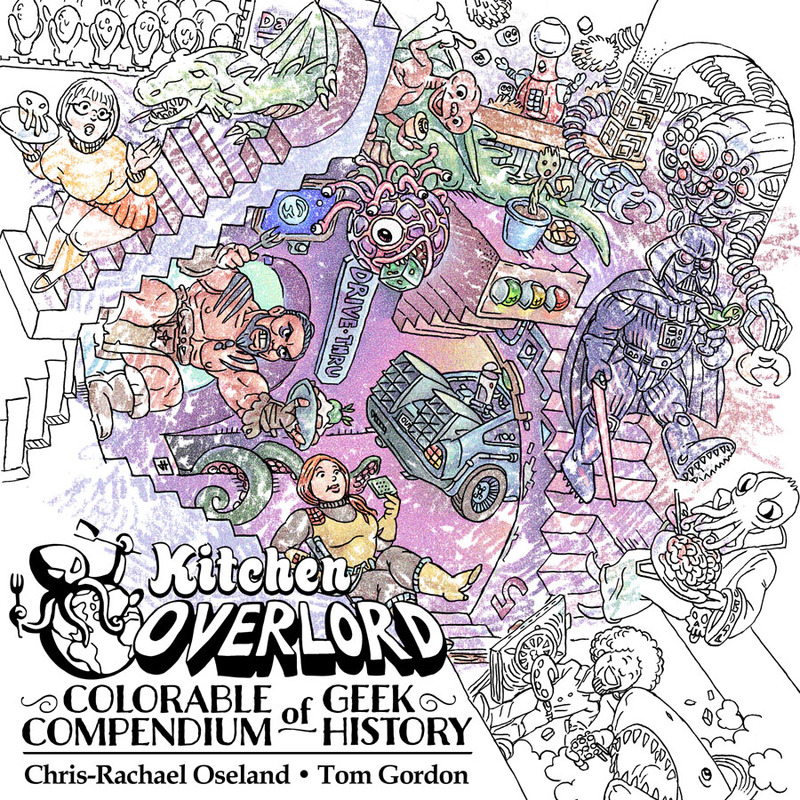 Since I know you probably just ignored that last paragraph and decided to do it all on your own, let’s talk about how to make your kitchen as small a disaster zone as possible. Start with the black dough. You want to give it the most possible rise time. Mix the yeast, warm water, and if you feel like cheating, a teaspoon of the sugar. Once the yeast has dissolved, let it proof for 10 minutes until you achieve something that looks like puckered and scabby tanned skin. After all, these are Deadpool rolls. Add in everything but the flour and give the mix a good thrashing. Now, before you get cocky and add your flour, go ahead and mix the water, yeast, and maybe a little sugar for the red dough. Once that’s dissolved, get back to working on the black while the red proofs. Mix the flour into your black slurry until you achieve a dough. If you have a stand mixer, let it knead away for the next 6-8 minutes, or until your dough is smooth and elastic. If not, you’re going to have to do it by hand, which should take you more like 8-10 minutes. Once the black dough is finished, cover it with a clean kitchen towel and set it aside to rise. Set a timer for 60 minutes. Your second batch of yeast should now be ready and waiting. Once more, add in everything but the flour and mix it up until it’s the color of stale blood. If it doesn’t look bloody enough, add more red dye, plus maybe 1-2 drops each of blue and black. Before you mix in your flour, warm up your milk and mix it with the yeast for your final batch of bread. Once the yeast for your white dough is dissolved, get back to your red dough. Mix the flour into the bloody looking bowl. Just like with the black dough, either let your stand mixer do the heavy lifting for the next 6-8 minutes or knead away at it by hand for 8-10. Once your red dough is smooth and elastic, cover it with a clean kitchen towel and set it aside. Finally, tackle the white dough. Clever readers will notice the ingredients are different. That’s because vanilla, cinnamon, and eggs will all add a tint to your bread. You want to keep this one whiter than a Barry Manilow concert full of soccer moms. Mix in everything but the flour. Blend it all up, then add the flour. Let either you or your machine knead it into a smooth, elastic dough before covering it with a cloth and setting it aside. You don’t have to worry about it getting the least rise time. You’re only using a little. By now, you’re already exhausted – but wait! There’s even more work ahead! You should’ve heeded my warning. I tried to tell you to get minions before tackling this bread. You have three different colors of dough rising at slightly different rates. Cope. You may end up with a lot of quirky expressions on Deadpool’s face, but it’ll still work out in the end. Once an hour has passed since you finished the black dough, it’s time to start with the shaping. I’m sorry I don’t have more photos, but unlike you astute readers, I didn’t have minions to help me assemble this. Until the Phoenix Force decides I’m worthy of telekinesis, I’m limited to what I can achieve with only two hands. (C’mon, Phoenix Force. I’m already a redhead, and it’s not like you have high standards. Let’s make something crazy happen.) Don’t repeat my mistake. There is, indeed, a trick to shaping the dough. First, roll out two long cylinders of the white dough. These will be his pupils. Next roll out two long, flat rectangles of black dough. You want the black to be half again wider than the white. Tightly roll the white dough in the black. Think of it like making a corndog that can watch and judge you with every bite. Cut off the ends so you can see exactly where the white interior will line up in the next stage. Set your eye tubes aside. Now roll the red dough into a much wider rectangle. You’re going to use the same technique here as I used in making the Superman Bread. Fold the red dough into a tight S shape with a lot of leftover dough flopping about on each side. Stuff the black and white tubes in the middle of the S, so it looks like you have a single red line separating two black tubes. Line them up as precisely as possible. You want the white pupils to be parallel. Now firmly and quickly wrap the rest of the loose red dough around the eyes. You should have enough to loop the center eyes a couple of times. If it looks like your eyes are getting off center, stop and adjust. It’s okay if have to unroll the whole thing in frustration and start over from scratch. I did. 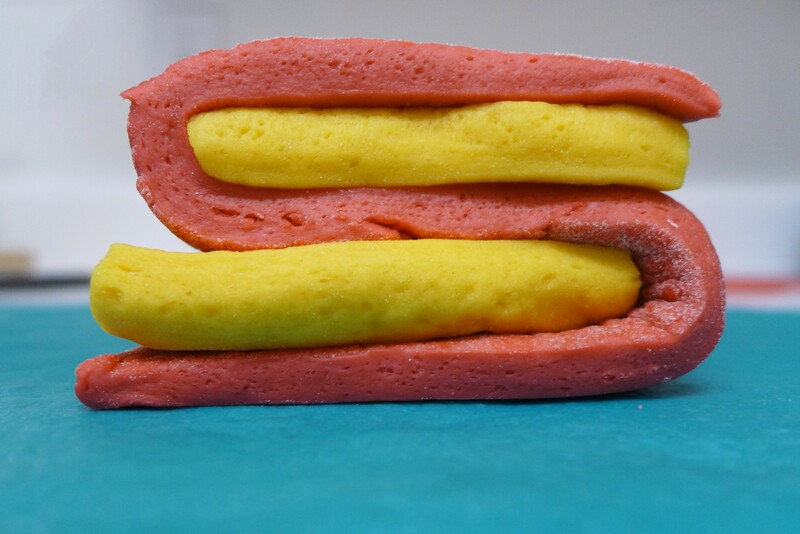 You should now have a red tube of dough with a thick red line down the middle. On either side of that line, a white-in-black eye stares accusingly at you. Good job. Set your hard won tube aside and grab the last of your black dough. Roll it into a HUGE rectangle. 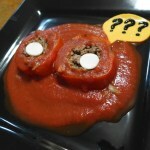 You want to be able to wrap it snugly around the red dough so it loops twice. This will prevent breakthroughs. Not of the scientific kind, or even a realization that the barista doesn’t love you back. Mostly, it’ll stop your red bread from breaching the black perimeter. Lube up a couple of cookie sheets. It’s time to cut this roll into slices. Get your sharpest knife. Hold the roll firmly and make a single, decisive cut about one inch from the end. 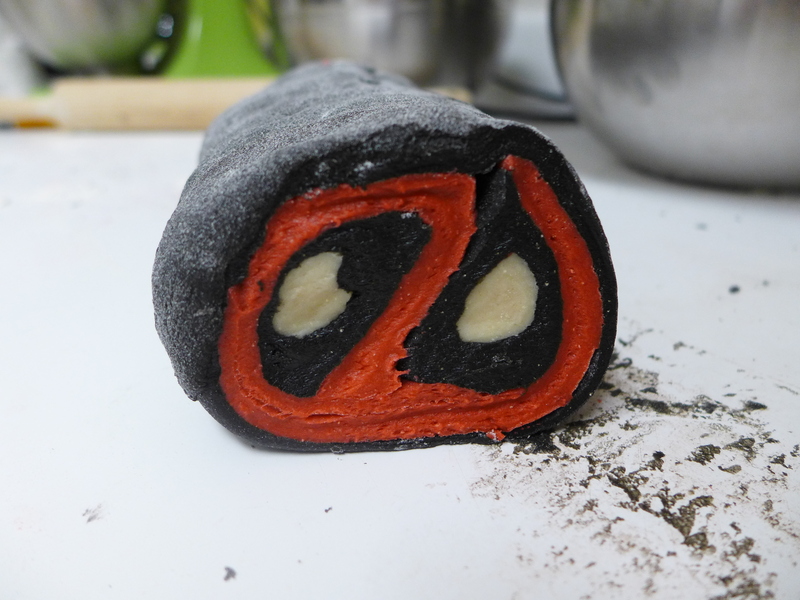 If you’re squeamish about it, you’ll just mush the bread around, malforming poor Deadpool’s face. Between every slice, rotate the roll a quarter turn. This keeps it from malforming too much. Each slice will probably need a little tapping and molding to get it back into a proper circle. Don’t be shy. 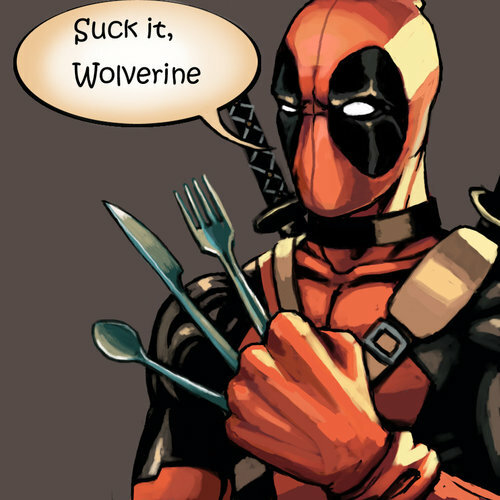 Deadpool likes it a little rough. Arrange the rolls 2-3 inches apart on your well lubed cookie sheet and let them rise for 30-40 minutes, or until half again in size. You think you want to let them double, but if you do, you run the risk of them bloating out of control. Much like foreplay, you want to let these rolls get a little excited without them exploding before you’re ready. Whisk an egg with a dash of vanilla and a tablespoon of water. Paint the surface of the risen rolls with the egg wash. This makes them come out nice and shiny. 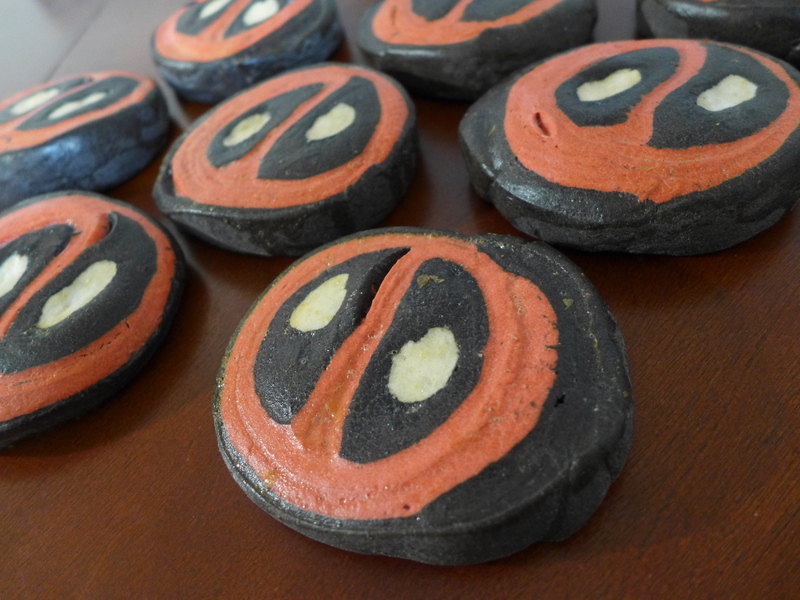 Bake your Deadpool rolls at 375F for 20-22 minutes. You don’t actually want them to turn golden brown. If you did, Deadpool would look even scabbier than usual. Instead, you want to leave them a little undercooked. This gives them more of the creamy texture you expect from a sweet roll while also preserving Deadpool’s mask. Once they’ve cooled, whisk your powdered sugar, water, and butter together to form a thin, sweet glaze. Paint a little of it on the surface of each roll. You want the sugar syrup to be mostly transparent, so go lightly. You can leave the rest of it on the side as a dipping sauce. All this effort netted me 16 sweet rolls with an uncanny resemblance to Deadpool’s belt buckle One of the great things about the natural warping that comes from doughs rising at different rates is that I ended up with a lot more expressive rolls than I expected. My favorite rolls looked moderately incredulous that I’d just gone to all this effort.